During the NAMM 2015 music event taking place this week Korg have unveiled a new addition to their range of synthesisers in the form of the new Korg ARP Odyssey. 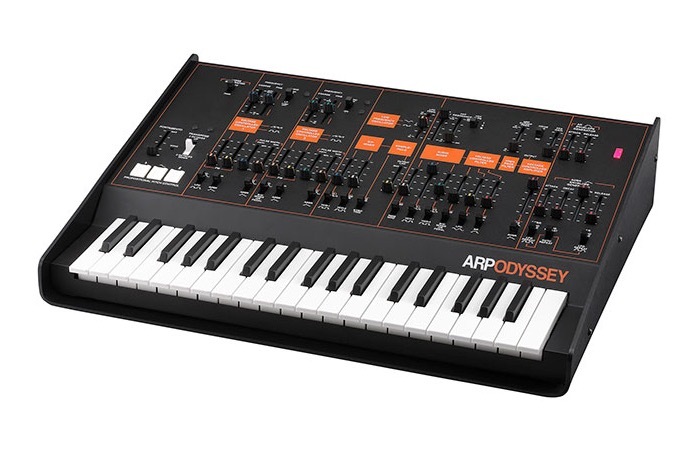 The Korg ARP Odyssey is a retro remake of the original Odyssey and the new instrument apparently has the same 2VCO architecture and promises to deliver the unmistakable penetrating sound of the original, says Korg. Kong has priced the new synthesiser (pictured above) at £935 for the standard version but there are also limited edition versions available that featured colour schemes from the orgingial Mk1 and Mk2 synthesisers, priced at £983 each. “Fans of the original Odyssey will, of course, notice some differences. Most notably, Korg’s version is 86% of the size of the genuine article, and its 37 keys are of the mini variety. The transpose feature gives this a 7-octave range, however. On the connectivity side, you get MIDI In and USB-MIDI ports, a headphones output with adjustable volume, and balanced XLR audio outputs. Patch cables are included, too.